League Division 2. Team changes. 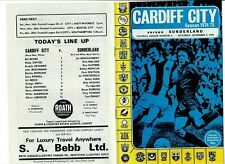 Cardiff City v Sunderland - League Division 2 - 02/11/1974 at The Ninian Park Ground. Programme is in a reasonable condition. Team changes written in etc. Dispatched with Royal Mail 2nd Class Large letter Save on overall postage with multiple buys as I can combine with purchases which are within 3 days of first item ending. From a smoke free home. Score and attendance neatly noted inside vertical crease. League Div2. Cambridge United v Sunderland. League Div2. Charlton Athletic v Sunderland. BRISTOL CITY V SUNDERLAND. 17 NOVEMBER 1973. 2nd DIVISION FOOTBALL. City may 19 1 bl. Oxford United v Sunderland. 6th March 1971. Condition - Minor dogging - See Pic's. 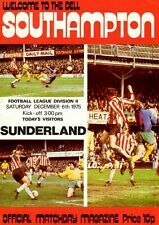 Official Matchday Programme BLACKPOOL v SUNDERLAND 20 April 1976. Division 2 Excellent Condition. No writing or obvious flaws Happy to combine postage for multiple purchases. Please request an invoice after final bid. UK only. BRISTOL CITY V SUNDERLAND. City bl 2019 11. 25 NOVEMBER 1972. RARE OPPORTUNITY. VERY GOOD CONDITION. Team changes, score and scorers on the back, no tears, clean staples, light creases. 2nd Division fixture. Fair condition. No writing. 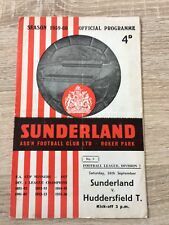 NEWCASTLE UNITED v SUNDERLAND. th May 1990. 20 without writing pages, nice clean centre staple, no bend/creases, clean pages and has a pic of the Sunderland team. Leicester City V Sunderland. 10th October 1970. Fulham Sunderland 1977/78. Dispatched with Royal Mail 2nd Class Letter. 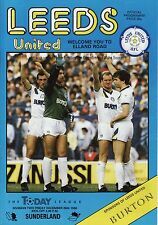 Plymouth Argyle v Sunderland 18/10/86 Programme. Good condition. No writing.